Habit: Annual to tree, vine. Leaf: generally opposite (whorled), entire; stipules generally fused to stem, adjacent pairs occasionally fused, or occasionally leaf-like and appearing like whorled leaves. Inflorescence: cyme, panicle, spike, cluster, or flower 1, generally terminal and +- axillary. 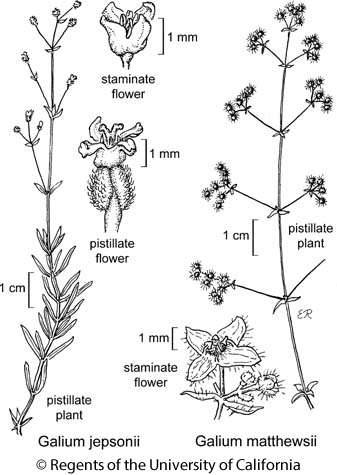 Flower: generally bisexual; calyx +- 4(5)-lobed, occasionally 0 (Galium, Crucianella) or 6 (Sherardia); corolla generally radial, 4(5)-lobed; stamens epipetalous, alternate corolla lobes, generally included; ovary generally inferior, chambers generally 2 or 4, style 1(2). Fruit: drupe, berry, or 2 or 4 nutlets [capsule]. Genera In Family: +- 500 genera, 6000 species: worldwide, especially tropics; many cultivated, including Coffea, coffee; Cinchona, quinine; many ornamental. Note: Diodia teres Walter doubtfully in California. Habit: Annual, perennial herb, occasionally subshrub, glabrous to hairy, generally scabrous; dioecious, bisexual, or flowers unisexual and bisexual. Stem: 4-angled, occasionally ridged lengthwise. Leaf: generally in whorls of >= 4, including leaf-like stipules. Inflorescence: panicles, axillary clusters (cymes), or occasionally 1 in axils. Flower: bisexual, or unisexual with sterile stamens or pistils; calyx 0; corolla generally rotate, occasionally +- bell-shaped, generally +- green, yellow to white, occasionally pink or red, lobes generally 4; ovary 2-lobed, styles 2, bases +- fused. Fruit: 2 nutlets or berry. Species In Genus: +- 650 species: worldwide, especially temperate. Etymology: (Greek: milk, from use of some species for curdling) Note: Ovary and fruit generally +- equally hairy on a pl; staminate plants generally identified by vestigial ovaries, pistillate plants generally by vestigial anthers. Galium saxatile L., Galium schultesii Vest, and Galium verum L. are lawn weeds in California. Habit: Perennial herb, erect, in small clumps, 8--16 cm, not woody, +- glabrous except leaf margin; dioecious. Leaf: in whorls of 4, congested near plant base, sparse distally on stem, 6--15 mm, linear to strap-shaped. Inflorescence: panicle, terminal, open, leaves +- 0. Flower: corolla bell-shaped, divided <= 1/2 to base, cream, +- glabrous, lobe tips generally pink. Fruit: nutlets; hairs ascending, short, strongly curved, not hooked. Chromosomes: 2n=22. Citation for this treatment: Valerie Soza 2012, Galium jepsonii, in Jepson Flora Project (eds.) Jepson eFlora, http://ucjeps.berkeley.edu/eflora/eflora_display.php?tid=26360, accessed on April 25, 2019. SnGb, SnBr. Markers link to CCH specimen records. Yellow markers indicate records that may provide evidence for eFlora range revision or may have georeferencing or identification issues. Purple markers indicate specimens collected from a garden, greenhouse, or other non-wild location.